A former factory worker who has fulfilled her dream of working with children has landed a national award just a year into her role caring for young people with autism and learning disabilities. 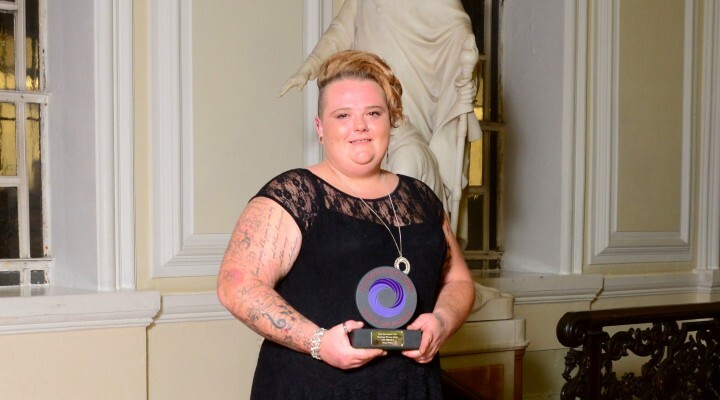 Amy Thomas, 30, who has been hailed as “exceptional” by Ty Bronllys Children’s Home in Brecon where she began working as a residential educational worker in February 2017, took home a bronze award at the 15th annual Wales Care Awards, sponsored by Onyx Healthcare. Having had a number of unfulfilling jobs in the past, Amy says she has finally found a career she loves and sees a long-term future in. Her rapid progress at Ty Bronllys had led to her being nominated for the Exceptional Newcomer Award, sponsored by Coleg Cambria, in the prestigious national awards which took place at City Hall in Cardiff. The Wales Care Awards, run by Care Forum Wales which was celebrating its 25th anniversary this year, has been dubbed the “Oscars” of the care industry as it acknowledges the hard work and exceptional performances of those in the sector. The former Pen y Dre High School pupil was previously employed as a factory worker and had a spell in retail before entering the care sector as a domiciliary care worker for the elderly two years ago. But Amy had always held hopes of finding a job working with children and that dream became a reality last year. She said: “I fell into care work by accident as I needed a job. As soon as I started I loved it. “But after 12 months I found it was repetitive. I didn’t feel personally that I was getting anything out of it anymore. “I saw a job advertised here and went for it. I’d always wanted to work with children as one of my friend’s boy is autistic and I’d spent a lot of time with him. “No two days are the same here and it is challenging but that’s what I enjoy. You feel you’ve achieved yourself when you help the children. Amy added: “We’ve got children aged from ten to 19 and have a school on site which they attend Monday to Friday. I provide support in the school and in the home. “On a day to day basis I provide personal care although we help them to live independently as much as possible. “During school the teachers will have things for us to do with the children and when it’s the holidays we’ll take them on days out. As part of her role Amy is also keyworker for a 15 year-old boy who stays at Ty Bronllys on a part time basis to give his family respite. She said: “I am responsible for keeping his care file up to date. He has epilepsy and his seizures are changing so everyone has to be on the same page so the care is consistent between us. “I’ve built up a real rapport with him, we’ve clicked really well. In nominating Amy, Ty Bronllys manager Elena Evstafieva said: “Amy works with young people who have been diagnosed with ASD (Autism spectrum disorder) and learning disabilities. She provides daily support for young people in the home and in school. “Since she started at Ty Bronllys Amy has built positive working relationships with all children and young people. “She is very enthusiastic, always wants to learn more, supports young people by promoting their independence and education, supporting them to learn life skills in preparation for adulthood. Mario Kreft, the Chair of Care Forum Wales, said: “There are only winners here tonight so it is only fitting that the finalists have receivee a gold, silver or bronze Wales Care Award. This entry was posted in Community, Featured, Health, News. Bookmark the permalink.